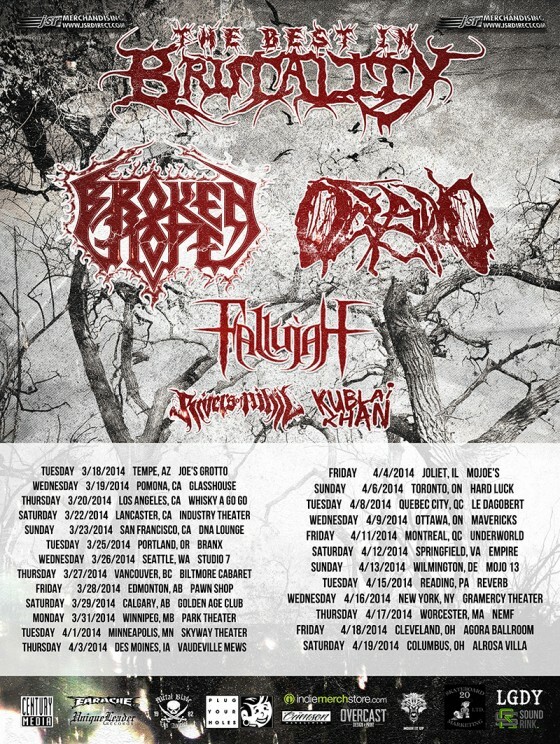 San Francisco-based atmospheric death metal collective, FALLUJAH, are very pleased to take part in The Best In Brutality Tour 2014 this Spring with co-headliners Oceano and Broken Hope. Set to join the tour on March 20th in Los Angeles, California, the near month-long run of live assaults will storm its way across North America, drawing to a close on April 19th in Columbus, Ohio. Additional support will be provided by Rivers Of Nihil and Kublai Khan. Named after a city in the Al Anbar province of Iraq, FALLUJAH was forged in 2007 as a politically charged five-piece from the Bay Area. With two demos under their proverbial belts, the band began touring in 2009. By 2011, FALLUJAH would go on to release their debut full-length, The Harvest Wombs, via Unique Leader Records. Christened, “a great jazzy blackened technical death metal album… definitely required listening,” by HeavyBlogIsHeavy and, “a very solid progressive death metal release,” by SputnikMusic who further gushed, “this band is technical, melodic and brutal and all of that at the same time… This will be, without a doubt, another of the big bands coming from the San Francisco Bay Area if they keep this up,” the record reaped critical praises from fans and critics searching for something beyond genre conventions. After drastic stylistic progressions, countless tours and hundreds of shows, FALLUJAH has become an expansive, complex and style-defining force for musical, mental and creative liberation. Check out the band’s three-song digital-only EP, Nomadic, released last Spring via Unique Leader at THIS LOCATION. Further FALLUJAH happenings to be announced later this year. Stay tuned.